Have your teeth lost their sparkle? Would a brighter smile make you feel more confident and youthful? The foods we love, like red wine, balsamic vinegar, tomato-based sauces, and blueberries can be perfectly healthy, but they come with a penalty: tooth stains. With Zoom! Teeth Whitening, you can have the bold, bright smile you want. Exposure to staining foods, drinks, and tobacco will turn tooth enamel from white to yellowish, brownish, grayish, or even bluish. Tooth enamel is porous, so it actually soaks up dark pigments and chromagens, which cause stains. In addition, tannins make some foods worse than others at causing stains. As years go by and teeth encounter more and more staining elements, they can tarnish to the point of aging a person’s appearance. Extrinsic stains are topical, on the surface rather than within a tooth, and they can be lightened or completely eliminated with dentist-administered chemical bleaching. At Docklands Dental Studio, we have decided to offer the potent, safe, and convenient Zoom! Whitening system, which brightens enamel up to 10 shades with a single, one-hour treatment. With a higher degree of active ingredient than over-the-counter whitening toothpastes, strips, or bleaching kits, Zoom! Teeth Whitening yields awesome results. We start by covering gum tissue with a protective barrier, then applying a bleaching gel to teeth. The new LED light technology emits at the optimal light spectrum. 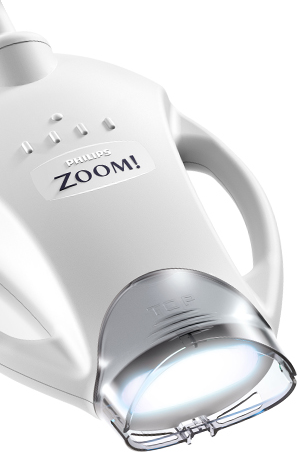 The light activates a photo catalyst within the Zoom! Light-Activated Gel to accelerate and enhance whitening results by breaking carbon bonds that hold stains onto teeth. When the gel is removed, stains are also removed, leaving tooth enamel up to 8 shades brighter. This chairside treatment takes about an hour. In combination with a professional-grade home whitening kit, which we can provide for you, the results of Zoom! Whitening can last for a long time. When your teeth begin to show signs of discoloration, simply wear your custom-fitted bleaching trays, lined with the prescription-strength whitening gel, as directed. We also recommend that you use an electric toothbrush. Studies have shown that while an electric brush is no more effective than conventional teeth brushing, patients tend to brush more thoroughly and for a longer time when using an electric toothbrush. With a whiter smile, you’ll feel confident in your image, because you’ll look younger, healthier, and more attractive. One study showed that a brighter smile can improve a person’s potential for being hired and making a higher salary (Kelton Research). Perhaps you’ll finally have the confidence to pursue that promotion, ask out that beautiful girl, or have a more active social life! Results will depend upon your natural enamel color, as well as the types and depth of your teeth stains. Most patients see dramatic results with a single treatment, and using the home kit as directed will help you maintain the results for quite some time. Of course, the frequency at which you’ll need to use your home touch-up kit or come in for retreatment will depend upon your unique case, including your dietary habits and whether you use tobacco. Our goal is to give you a beautiful, strong, healthy smile that’s good for your health, as well as your self-confidence. If your teeth are tarnished, call Docklands Dental Studio today to schedule a cosmetic consultation. We’ll help you decide on the best treatment plan to create a bright, gorgeous smile you’ll feel proud to share.